Dutchess ARC, a nonprofit agency for the developmentally disabled, wanted to mention the official opening of their new Pleasant Valley Residence and accompanying fundraising campaign at their annual Snow Ball gala. 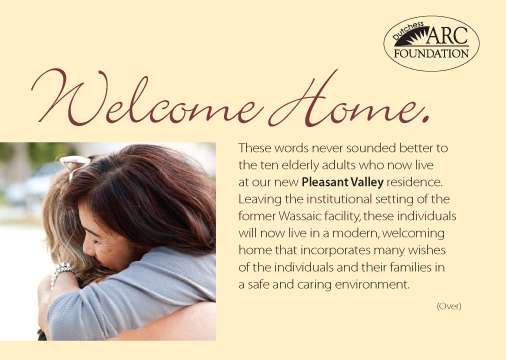 We recommended a colorful 2-sided postcard inserted in each guests’ event program that briefly told the story of the new facility, focusing on aspects that would resonate emotionally with the Gala guests, such as the modern, home-like environment, window views of local greenery, and personal touches in the residents’ bedrooms such as family photos or a favorite stuffed animal. We also hinted at the upcoming campaign to raise funds for a new generator that would ensure residents always have power for fans, light, heat, and medical devices. We made the fundraising drive more appealing by calling it the “Welcome Home” campaign, which is reflected on the front and back of the postcard.